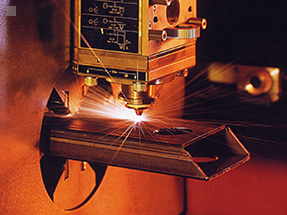 Laser tube cutting services from Alabama Laser are performed with three CO2 laser systems designed for cutting round, square, rectangular, flat, oval, and virtually any other type of tubes. 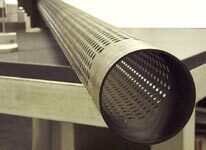 Our laser tube cutting systems enable us to cut slots and holes in round tubing with diameters up to 8 5/8" (minimum O.D. of 1/2") and square tubing with side dimensions up to 8". Maximum tube wall thickness = 5/8" on carbon steel and 1/4" on stainless & aluminum.. 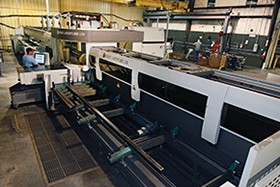 These laser tube cutting systems allow storage of tube bundles and can automatically load and position tubes with lengths between 10.5' and 24.5' without operator intervention. Shorter and longer tube lengths can be loaded manually (up to 27.5'). 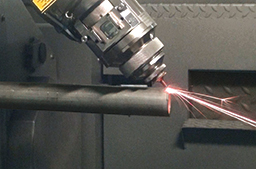 Our latest laser tube cutting system has a tilting axis which allows for angled cuts. In the past, if chamfered holes were required on tube parts, a secondary machine shop operation would be required. Now the bevel can be made with the laser tube cutter. screw machine in 10 min. Laser tube cut in 56 sec. With conventional machining - multiple processes. only 1 cycle is needed. Four photos at the top of this page courtesy BLM-Adige USA.